Gin is a very pure distilled spirit mixed with juniper and herbs. There's no limit to the ingenuity of mankind. Anyone who could look at a juniper bush and think: "You know, I'll bet the fruit from that tree would make a great addition to an excellent spirit" just has to be some kind of genius. 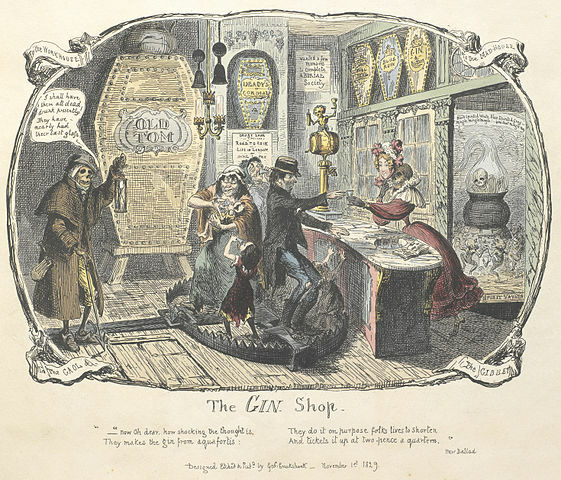 Adding the juice to distilled grains has created a drink popular for centuries: Gin. Distilled in column stills to create a very pure product, the result contains a minimum of congeners, a class of compounds that adds not only off-flavors but is often associated with hangovers. The spirit is often combined with other botanicals beyond juniper, such as coriander and cinnamon. The subtle differences between brands are a result of these secret recipes. Though gin is often associated with England, owing to the popularity of a type known as London Dry Gin, credit goes to the Dutch for its invention, who created a type now called Genever. During the 17th century it was used chiefly as medicine. That 'excuse' may be a joke in old films, but it was a reality centuries ago. Thankfully, civilization has evolved and we can now enjoy our spirits for the sheer joy of drinking. Gin made its way to England with the ascension of William of Orange to the British throne. Not for nothing was his campaign called the Glorious Revolution. He had the good sense to allow unlicensed production and the popularity of the beverage rose, even as its style changed. Dutch gin is distilled from barley and is somewhat nearer whiskey than the London Dry style, which evolved in the 19th century. Later, that good sense was abandoned with the imposition of a gin tax in 1736. Riots soon followed. Gin drinkers understand politics better than parliament, clearly. The politicians came to their senses six years later and abolished the tax. One difference today is that the London style, since it uses column stills, rather than the pot stills preferred by the Dutch, tends to have a higher alcohol concentration. London Dry often reaches 90 proof (45% ABV). The other difference, and it's a significant one, is that in Holland Genever is aged in oak casks for up to three years, again like whiskey. The result is a more full-bodied flavor. Interestingly, the most popular brand in the U.S., Seagram's Extra Dry, is a combination of the two styles. It's aged in oak casks for three months, where it becomes a pale straw color and a truly mellow drink. Because the taste of dry gin is similar to vodka, with a very pure and alcohol-like mouthfeel, it is often mixed with mixers. The popular gin and tonic was invented to mask the taste of quinine used to combat malaria in India during the British colonial period, harking back to earlier practice. But a good gin-based drink today has fine qualities that go far beyond the medicinal. Bombay Sapphire, for example, may have hints of almonds, liquorice or even lemon. Tanqueray, a newcomer to the scene but winner of many awards since, uses a whole array of fruits to flavor the base liquid. As the basic ingredient of a gin martini, this fine spirit has only one peer - vodka. But those who love a good martini can readily tell the difference. This combination of gin and white vermouth is bound by no country. It is enjoyed the world over. The design of the bottle seems to be almost as important as the content for premier brands in the case of gin. If you have a cocktail cabinet, you also have the chance to fill it with stylish bottles and cocktail mixing implements, including crystal shakers and silver stirring utensils to ensure quality and enhance the ceremony of cocktail mixing which is always improved by drama and it is as essential to the enjoyment of a cocktail as the drink is. Whether preferred simply served with tonic and a twist of lime or in a gin martini, straight or in a cocktail, though, there's one thing that remains the same. Ingenuity has created a fine spirit for the enjoyment of all.